A2L Refrigerants, particularly R32, are becoming more widely used but have largely slipped "under the radar" in terms of safe handling. As with all refrigerants they have advantages but risks. With the increasing costs and legislation associated with the traditional 'F Gas' refrigerants the search for, and introduction of, alternatives has become far more urgent. 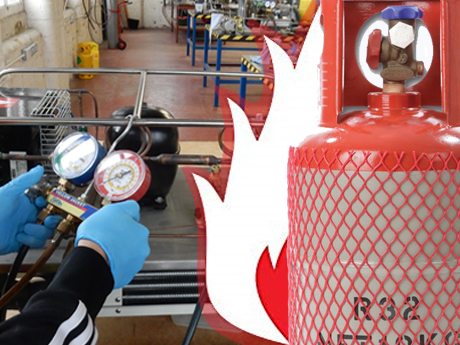 Natural refrigerants such as ammonia and carbon dioxide are a valuable part of the arsenal and work well in certain applications but there are also well documented hazards in their use. Hydrocarbons, R600a - Isobutane and R290 - Propane for example, have grown in popularity in recent years and offer a lower GWP to the equivalent fluorocarbons but are flammable and classified A3. To try to achieve a compromise, A2L refrigerants, offering both lower flammability and lower GWP are being developed. The most commonly used one at present is R32 which is being phased in as a replacement for R410A in split air conditioning systems and potentially in VRV/VRF systems in the future. BUT - can you safely handle them? Not included in the syllabus for either the City and Guilds 2079 (F Gas) qualification or the City and Guilds 6187-21 (Hydrocarbon) qualification at present we have included information to be able to utilise A2L refrigerants within our Hydrocarbon course presentation. Designed for experienced engineers who will already hold a valid F Gas qualification such as the City and Guilds 2079 you will achieve your city and Guilds 6187-21 Hydrocarbon qualification while gaining a valuable insight into the issues surrounding the A2L refrigerants - all in 1 Day!